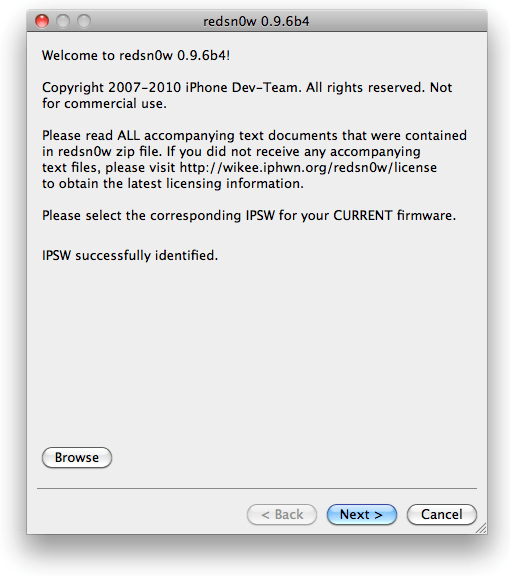 Redsn0w(redsnow) has been updated to version 0.9.6b4 and it can now jailbreak iOS 4.2.1 for all iDevices (but tethered for new ones). For those who don’t know, redsn0w is a windows tool jo jailbreak iPhone, iPod Touch and iPad. Works for all iDevices. But for newer devices (iPhone 4, iPhone 3GS with new bootrom, iPad, iPod Touch 3G and iPod Touch 2G with new bootrom) it is still tethered, which means that you’ll need to connect your newer iDevice to PC if you reboot them. Unlockers please stay away from this release. It upgrades your baseband and you’ll loose unlock, possibly forever. Windows 7 users should use Windows XP compatibility mode. Download iOS 4.2.1. Download links given below. Download redsn0w 0.9.6b4. Download links given below. Open up iTunes. It’ll detect your iPhone. Press Shift and click restore. Browse for the ipsw file you downloaded in step 1. iTunes will restore the iDevice to 4.2.1. Let it do its work. It may take some time. Open redsnow (redsn0w). Browse for the ipsw file you downloaded in step1. It’ll verify the file. Click next. Check “Install Cydia”. Check other options only if you know what you are doing. Switch off your iPhone and click next. It is very important to switch off your iPhone. Once done, it’ll start the jailbraking process. Relax and let it do its work. Do not interrupt or attempt to turn off the device. The jailbreak will complete in few minutes. You’ll be able to open your iDevice but won’t be able to open Cydia. To open Cydia, connect iDevice to computer and open redsb0w again. 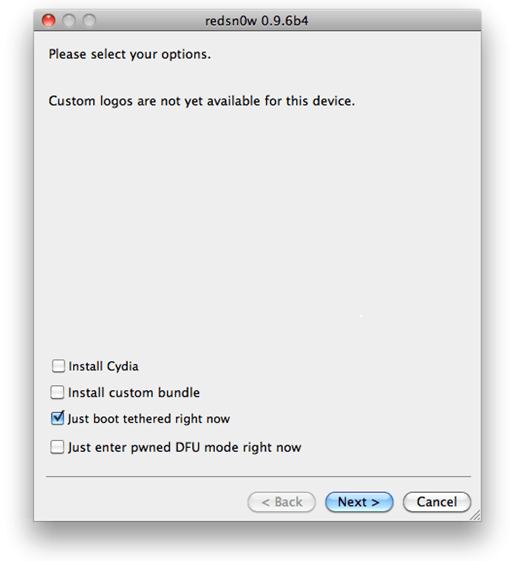 Do everything again but this time, choose “Just boot tethered right now”. The device will now boot in jailbroken state and you’ll be able to run cydia. For more such updates on iPhone jailbreaking and unlocking, subscribe to technoNix via email or connect with us via our facebook fan page. if my ipod touch 4th gen turn off and if i can’t turn it on wat should i do?? my ipod touch gets stuck on the step 9 and it says “Exploiting with limera1n” what do i do? pls help!!! “WAITING FOR ACTIVATION” and no signal;/ what i have to do now? WAITING FOR ACTIVATION iphone 3g ka daryti nera rysio? my redsnow crashed before the jailbreaking completed. what do i do. it says downloading jailbreak data. horray, Its worked.. just right klik, and compatible to win xp, for win 7 user. I just want to confirm Yosep_reky and ibymalik this method works great! Thank you so much! worked fine, all of it. what do i do if the pineapple shows up and the loading circle and doesnt move from that..it just keeps making a noise. is it supose to take over 30 mins for the jailbreaking prossecs!!! Why doesn’t redsnow work with ipod touch 2G ? after i browsed the firmware it loads about more than 30 minutes and i still cannot click the next button !! does it needs to load this long ? I’ve been trying to run the jail break on my IPHONE 3GS. I’ve downloaded the Ios4.2.1, and redsn0w 0.9.6b4 and have extracted both files. When i run the redsn0w, I choose browse to look for the Ios that I downloaded. The ISO program is there, but redsn0w is not finding the ipsw files. Anyone know how to fix this? iv got an iphone 4 followed the instructions and its still not done it im trying to re boot the phone with out itunes any ideas ?? i jailbrealed my ipad but im stuck on the apple logo… why is tht? what do you do when it says unexpected error during preparation after your ipsw is identified? I am stuck on the apple logo! whats happening? How can I tell if my iPhone 3G is unlocked or not? And what redsn0w version would I want to download on XP sp3? I am running 4.2.1 right now from iTunes 10.2. Kinda new at this so please help me out here. Sim card while jailbreaking? Just want to get it right the first time. I have an Iphone 3GS it’s 4.2.1 and when i was doing redsnow it keeps getting stuck at “Waiting for reboot.” I tried looking around google and youtube and all it says is that it takes like 10sec. And its been 1 hour and my phone has a blank screen. Help? how long should the download take? im stock in exploiting limera1n for 10mins how long will it takes? Got a first generation Ipad, and after I followed all the instructions.. All I’m able to view is a black screen with a pineapple in the middle! What to do? im stuck in exploiting limera1n? PLS. HELP ME… HOW LONG DOES IT TAKES? thanks.. working perfectly.. no problemo encuentro..
Hey, I need some help opening up the network on an iPhone 3G 4.2.1. I have downloaded the firmware as well as the redsnow 0.9.6b4. iTunes is open as well as redsnow, but when I have to search for the firmware (which I saved on the desktop) it’s nowhere to be found. Could someone please assist? Do not see any IPSW file in download from iphone 3G?? I’m keen on the precious data anyone deliver in your content articles. I am going to bookmark your blog site in addition to look into just as before in this article usually. I’m rather i shall learn numerous brand new stuff here! Enjoy for the following! came across this during my hunt for something concerning this. © 2012 technoNix. All rights reserved.